For the purposes of this article, we refer to cosmetic dentistry in Mexico as improving the aesthetic appearance of your front teeth. Cosmetic dentistry would include placing crowns or veneers on 4 to 8 of your front teeth (incisors). It includes just the top jaw or both top and bottom jaw. This is an example of cosmetic dentistry just on the 6 front teeth. Although her molars are stained, they were perfectly fine to support her balanced bite. We encounter many patients who want a smile makeover just on their front teeth when they go to Mexico for cosmetic dentistry. This is common. However, you NEED good molar teeth that have a functional bite in order to get cosmetic dental work. Your molars have to be able support your biting forces. Likewise, you may not be able to proceed with cosmetic dentistry in Mexico if you are missing major sections of your molars from previous extractions. Why are we telling you this? If your molars do not have a good functional bite, your new dental crowns or veneers would eventually fail within a short period of time. 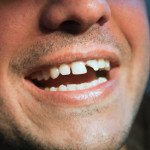 We also would like to warn you of inexperienced or dishonest dentists in Mexico that would perform cosmetic dental work even if they know that your bite is not balanced. They just care about earning your money for the day and let you worry about the rework on your own. Both cosmetic dentistry procedures accomplish the same thing – give you a perfect Hollywood smile. A veneer is a thinner porcelain material that goes in front of your teeth. The advantage of a veneer is that your cosmetic dentist in Mexico does not have to remove as much tooth structure as a dental crown. The disadvantage of a veneer is that it is not as strong as a crown. They are more prone to chipping or dislodging. This is an example of full mouth cosmetic dentistry in Mexico using crowns. Zirconia crowns will go on top of these meticulously prepared teeth. A crown is a porcelain or zirconia material that covers the entire tooth up to the gum line. The advantages of crowns are that they are stronger and last longer than veneers. The disadvantage of dental crowns is that they require the removal of more tooth structure compared to veneers. For aesthetic dentistry in Mexico, many dentists are biased towards dental crowns. Why? Dental tourism patients typically live far from their Mexico dentist. You cannot just conveniently drive a few blocks to see your local dentist if your veneers chip. If done correctly by a highly experienced dentist in Mexico, your dental crowns can last up 25 years or more. However, if you are young and careful with your teeth, get dental veneers in Mexico. Lumineers can also be used instead of veneers for your cosmetic dentistry in Mexico. Lumineers are even thinner than conventional veneers. We can easily tell if someone received bad or cheap cosmetic dental work from a US dentist or Mexican dentist. The teeth hardly have any natural color or translucency. Typically, they are “snow white” with no natural shading or translucency. 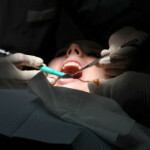 Here is a scenario you want to avoid when going to Mexico for cosmetic dentistry. You shop for a so-so dentist with the cheapest price (like those $150 crowns or veneers on flyers peddled on the streets in Mexico). Then you ask your dentist for ultra-white, the whitest you have. Oh, and yes, can I get them the same day…? This is a recipe for getting new teeth that look like Chiclets! We are serious about this. Why rob yourself the opportunity to get a life-changing smile that people will adore and admire? For us in the dental industry, we can tell in 5 seconds that you have cheap crowns. For others, you just look a bit odd with unnatural looking white teeth. Color. You can choose the whiteness of your teeth. Typically, the teeth color goes from A0, A1, A2, A3 and so on. A0 is super white. Before choosing A0, look for actual samples. You wouldn’t want to choose something for your cosmetic dentistry in Mexico that you might regret. Most dental tourism patients choose the color A1 or A2 if they want really white teeth. Translucency. More importantly, let´s discuss translucency. Translucency is the ability of a tooth to let natural light pass through. Chiclet´s have no translucency. Natural teeth have good translucency. The best dentists in Mexico use dental labs that create high quality crowns and veneers that have natural translucency. The difference in price between an average cosmetic dentist and a top cosmetic dentist in Mexico is approximately $50 to $150 per crown or veneer. The savings for a full upper cosmetic dental work between an average and a top dentist in Mexico doesn’t even amount to the savings you received with just one crown had your gone to your US dentist. Those Mexico dentists that offer cheap crowns may not be using high quality laboratories and materials. Not all porcelain materials are the same. Good brands have good translucency. Good laboratories take time to make your teeth look as natural as possible. That requires time. Those dentists who brag that they own their own lab do not necessarily have the edge to complete your smile makeover in Mexico. Top dental lab technicians are hard to find, you can’t just hire them to work in your back office. They may be able to deliver your crowns or veneers the same day, but it’s not the best quality. Likewise, avoid choosing Porcelain Fused to Metal Crowns (PFM) for your front teeth. They may be cheaper. But they impede translucency. Also, the metal on the crown may show as you age or if your gums recede. 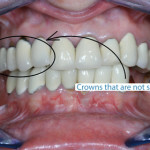 PFM crowns are primarily used for molar teeth. “We know that cosmetic dentistry is a life-changing experience. Prosthodontists use extra tools such as an articulator to capture your jaw movements. It helps create an accurate and functional design of your dental crowns or veneers for cosmetic dentistry. How can you avoid new teeth that look too small or too big? Choose a trusted Prosthodontist in Mexico. Prosthodontist have extra years of training in teeth anatomy and balancing your bite. They generally have better training for cosmetic dentistry in Mexico. However, you cannot just choose any Prosthodontist. 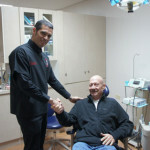 Choose a well-respected Prosthodontist in Mexico that has several years of experience. Find a dentist that owns his own dental practice. They are generally more successful and have more experience. On the other hand, they are many other highly experienced general dentists in Mexico that can do excellent cosmetic dental work. “Cosmetic dentistry is not just about precise anatomy and measurements. It is also an art. Artistry can only be honed through experience. We look at your facial features – shape and symmetry of your face, color of your skin, the smile line of your lips. We ensure your gums have a harmonious architecture. We consider everything to get the exact size, shape, and color of your new teeth. We work with the top lab technicians for your cosmetic dentistry in Mexico. To be successful, you have to closely review the credentials of the dentist. You can go with a referral from a friend who had cosmetic dentistry in Mexico or call Dayo Dental at 877-987-3296. We can schedule you with a top dentist that will give you that perfect Hollywood smile.